One of the most consultations of my site, are the maintenance books. And time after time people are shocked by the yearly costs. Especially the costs of the overhauls are experienced as high. To give a better insight, I have made a page where the overhaul of October 2002 will be explained. Please keep in mind that my S4 drives about 20.000 kilometers between two overhauls. A overhaul is in that case necessary. As usual, all the pictures can be found on webshots. An overhaul is in basic a standard procedure. The replacement of certain parts, as motor oil, sparking plugs, and the air, oil and petrol filter. Besides that the braking system and the illumination is checked. In case of a combination with a periodic inspection (obliged in Holland, every year, is called APK) also the exhaust gases are checked and for instance the working of the windscreen wipers. This time the script said that the front brake discs had to be replaced. In contrast with used discs, new brake discs are dull. The brake-blocks will planish them. 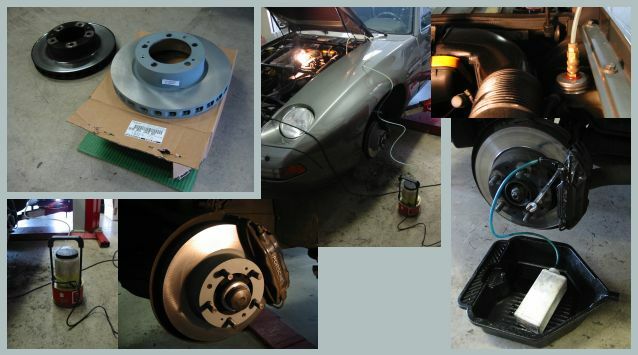 If the brake discs have to be replaced, the brake-blocks must also be replaced. Checking the brake liquid told us, that we had to replace that as well. In that case the brake pipes must be flushed. All four brake pipes are drained at the brake saddles. On the bill we find two brake discs, a brake block set T2/993/RS/928 S4 and brake grease. My S4 drives all the year round. That also means that he encounters snow, ice and pickle. Therefore the fuel pipes are provided with a new layer of rustproof and the winter tires are assembled. On the picture you can see the fuel pipes and a winter tire on the wheel balancing machine. Tires that are stored for a while always have to be balanced. Of course you also must add some air. Costs wheel balancing and rustproof: 60,00. When the obliged period examination is done, you do not want to run into surprises, so the illumination is checked and adjusted and the exhaust gases are analyzed. During these tests we found that the registration plate illumination was not working properly. Costs: 25,82. Besides al the things we can find on the bill the administration costs for the examination (18,50) and the costs for the used oil (5,00). Altogether eight hours of work were done. This was for the large overhaul, the replacement of the brake discs and the brake liquid and welding the exhaust. Costs: 380,00 euro. The VT completes the bill. 1401,86 euro. Many thanks to Johan van der Gugten, who was willing to let me take a close look in his garage and who did not mind (well, only a little) somebody looking at his fingers the whole day. 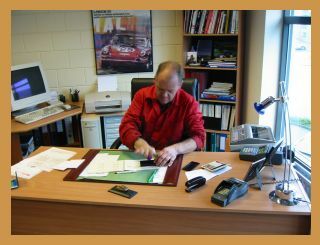 On the last picture you see him putting a stamp into my maintenance book, just after I paid the bill.